At Monroe Carell Jr. Children’s Hospital at Vanderbilt, our work extends beyond patient exam rooms. We are also searching for discoveries to offer better treatments, provide quality care and train the next generation of clinicians. The profiles here represent only a sampling of the tireless work performed daily to make Children’s Hospital a place of unwavering hope. In each issue, we also include a profile to highlight our longstanding partnership with our community pediatricians who help ensure all children receive the best care each and every day. John Pietsch, MD, Pediatric Surgery. Photo by Susan Urmy. Few things have given John Pietsch, MD, greater satisfaction than watching the critically ill infants and children he has treated grow up to lead happy, healthy and productive lives. Pietsch has contributed to hundreds of these success stories since 1989, when he established the extracorporeal membrane oxygenation (ECMO) program at then Vanderbilt Children’s Hospital, now known as Monroe Carell Jr. Children’s Hospital at Vanderbilt. His first ECMO patient at Vanderbilt, Chelsea Brown, graduated from Northeastern University in Boston in 2013 with a degree in architecture. Currently, she is a project manager for a Boston-based architectural firm. ECMO delivers oxygen and removes carbon dioxide from the blood as it passes through a machine outside the body. This allows the lungs and hearts of critically ill patients the time to rest and heal. First shown to be effective in newborn babies, ECMO is now used in older children and adults. Pietsch joined the Vanderbilt faculty in 1986. Three years later, he brought the ECMO program from the University of Louisville in Kentucky to Vanderbilt. Since then, more than 1,100 ECMO procedures have been performed at Children’s Hospital, and now there is a separate program for adults at Vanderbilt University Adult Hospital. As one of the nation’s top ECMO centers, the program at Vanderbilt has received the Extracorporeal Life Support Organization’s Award for Excellence in Life Support. On July 1, 2018, after 29 years, Pietsch stepped down from his role as director of the ECMO program at Children’s Hospital. But that doesn’t mean the 72-year-old professor of Pediatric Surgery and Pediatrics is retiring — far from it. The move gives him more time to devote to the Junior League Center for Advanced Maternal Fetal Care, which he co-directs, as well as teaching and research. A fellow of the American Academy of Pediatrics, the American College of Surgeons and the Royal College of Surgeons of Canada, Pietsch grew up in Michigan and attended medical school at the University of Michigan. During his junior year, he thought that he might want to become a pediatric surgeon. After spending a month with the group at Boston Children’s Hospital, he was convinced. He trained in general surgery and pediatric surgery at McGill University in Montreal, Canada. He began his pediatric surgery career at Louisiana State University in Shreveport, and then at the University of Louisville before joining the faculty at Vanderbilt. Thirty-two years later, he’s still excited to come to work. One of his research interests is finding ways to prevent malnutrition in pregnant women. Lack of adequate nutrition during pregnancy can increase the risk of premature delivery, gestational diabetes and preeclampsia, high blood pressure during pregnancy that can lead to serious complications for both mother and baby. At the Fetal Center, Pietsch and his colleagues are treating lung problems in the fetus before birth, and improving the treatment of diaphragmatic hernia, an opening in the diaphragm that allows the stomach and other abdominal organs to squeeze the developing heart and lungs. In addition to his professional pursuits, Pietsch said he’s looking forward to spending more time with his family, including five grandchildren. Oncology. Photo by Susan Urmy. Candy Stefansic, RN, MSN, CPON, a former Neonatal Intensive Care Unit (NICU) nurse at Monroe Carell Jr. Children’s Hospital at Vanderbilt, had just given birth to her triplets — Thomas, Althea and Eva — and found herself needing help from the place she’d worked for years. Two of her babies were admitted to the NICU for feeding issues. They spent 13 days there and received amazing care. Wonderful co-workers is one of the reasons Stefansic has been devoted to her health care career at Children’s Hospital for 23 years. Stefansic began her journey at Vanderbilt University Medical Center (VUMC) the day she was born in its labor and delivery ward. Medicine had always been a part of her life. Her mother, Carolyn Fruin, was a nurse at Vanderbilt, and her father, Alan Fruin, MD, now a retired neurosurgeon, was doing his residency at Vanderbilt when she was born. Following his residency, her father moved the family to Nebraska, where Stefansic was raised. She completed her undergraduate degree at Peabody College of Education and Human Development at Vanderbilt University, and then went through the Bridge Program to earn her Master of Science in Nursing with a concentration in pediatrics. 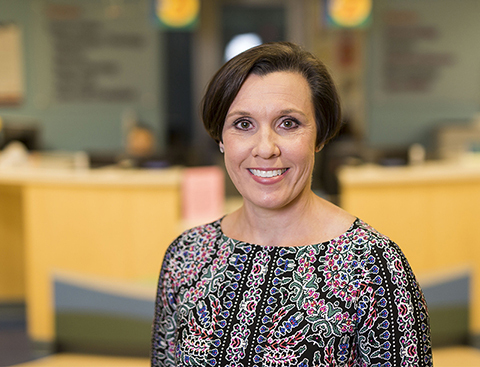 She began working at VUMC in 1995, and over the years, she held many roles in the hospital, including a NICU staff nurse, charge nurse, transport nurse and night shift assignment manager. In 2002, she transferred to the Pediatric Oncology unit as a staff and charge nurse and later served as a neuro-oncology case manager and manager for Pediatric Hematology/Oncology. Helping children who have cancer has been life changing for her. Stefansic has been married for 17 years to her husband, Jim, a biomedical engineer. They have four children: Clara, 10, and the triplets, now 8. When she’s not spending time with her family, she enjoys early morning exercise. Deepak Mehrotra, MD, Community Pediatrician. Photo by Susan Urmy. When expectant parents interview Deepak Mehrotra, MD, as a potential pediatrician for their unborn child, they often ask questions about how long he has been practicing and how long he plans to stay in his current position. “They seem to be reassured that I’ve been practicing at the same clinic for 20 years, and that I don’t plan to leave,” Mehrotra says. Mehrotra joined Children’s Clinic East in 1998 after completing his residency in Pediatrics and serving for an additional year as chief resident at the University of Mississippi. At that time, Children’s Clinic East, which was founded in 1951, had one location in Hermitage, Tennessee. Mehrotra was the fifth physician in the practice. The clinic has since expanded to include to two more Tennessee locations in Mt. Juliet and Lebanon and now has 15 pediatricians and two pediatric nurse practitioners. Mehrotra values the long-term relationships he has been able to build with patients and their families. Mehrotra grew up in Jackson, Mississippi, the son of two college professors. Having “inherited a love of teaching” from his parents, he volunteered to mentor Vanderbilt University School of Medicine students and residents as soon as he started practicing at Children’s Clinic East. Trainees rotate through the clinic to gain experience in a community pediatric practice. Mehrotra is also the current president of the Cumberland Pediatric Foundation (CPF) board. CPF is a nonprofit company that promotes the health care and wellness of children and their pediatricians by providing primary care physicians — members of CPF — with education, research and networking resources. CPF is affiliated with Monroe Carell Jr. Children’s Hospital at Vanderbilt and offers opportunities for community physicians and their patients to participate in clinical research. Mehrotra has been a member of the CPF board since 2014. “I enjoy helping guide the organization and its mission of providing education and research connections between the Department of Pediatrics at Vanderbilt and community physicians,” he says. In his free time, Mehrotra enjoys hiking, biking, playing tennis and spending time with his family. He and his wife, Seema, are proud parents of two young adults — a daughter who is a second-year graduate student and a son who is a junior in college. Mehrotra calls himself an “ardent fan” of the NHL Nashville Predators and says his family has enjoyed the lively atmosphere and fast pace of hockey games. The team’s first season was in 1998, the same year the Mehrotra family arrived in the Nashville area. “It was inevitable for us to be Predators fans,” Mehrotra says with a chuckle. Kris Rehm, MD, Outreach Medicine. Photo by John Russell. Kris Rehm, MD, loves running for the same reason she is passionate about pediatric medicine — even when something seems too difficult to overcome, you must at least try. That same mantra also helped her through a battle with breast cancer in 2013. “What I love about running, and that I think is most applicable to medicine, is that you learn with hard work, dedication and persistence that you can continue to improve,” said Rehm, vice chair of Outreach Medicine and medical director of Hospital Operations for Monroe Carell Jr. Children’s Hospital at Vanderbilt. She has run 12 marathons and is training to run her third Boston Marathon. Running, after all, is what led her on a path toward medicine. Growing up in the small, rural community of Macomb, Illinois — where most worked in either farming or education — Rehm fell in love with athletics, participating in basketball, softball, track and field as well as cross country running. She knew she wanted to be a collegiate athlete and decided to focus on running, believing that was her best shot. Recruited on athletic and academic scholarships, she chose to attend Ohio University in Athens, Ohio. She intended to pursue physical therapy with a focus in musculoskeletal rehab but switched her trajectory toward medicine the summer before her junior year. After graduation, she attended Northwestern University Feinberg School of Medicine, in Evanston, Illinois. As a medical student at Northwestern, she participated in the Cabrini Green Youth Program in Chicago, working through Children’s Memorial Hospital in a health care clinic to address the needs of socioeconomically disadvantaged children. She also started a running club for middle school-age girls and participated in reading, tutoring and mentoring programs. “I loved Children’s Memorial Hospital, loved working with children and working with children from urban and underserved backgrounds. The experience completely sealed the deal for me to do pediatrics,” Rehm said. While in medical school, Rehm met her husband, Christopher, whose focus is in physical and medical rehabilitation. They matched as a couple for residency in Boston, Massachusetts, where Rehm went through Boston Children’s Hospital’s Combined Residency Program and also served as chief resident. In 2002, they decided to move to Nashville, where Christopher had attended Vanderbilt University for his undergraduate education. Rehm joined Old Harding Pediatrics and its teaching team that worked with students at Vanderbilt University’s School of Medicine. Shortly after her first set of twin sons, Jackson and Lucas, were born in 2004, she decided to change tracks and joined Children’s Hospital, signing on to help launch the first hospital medicine program. Three years later, in 2007, Rehm gave birth to another set of twin boys, Grant and Logan. “I love the academic environment. I love teaching. I love collaborating with subspecialty colleagues and the diversity of the patient demographics,” she said. Children’s Hospital had three hospitalists when she began. In 2009, the hospital formed the Division of Hospital Medicine, with Rehm serving as the inaugural director. Currently, there are 22 hospitalists. Hospitalist medicine provides general clinical pediatric care to hospitalized patients. The concept arose in the mid-1990s, when across the nation, busy private practices, combined with increased traffic congestion and higher patient acuity made it difficult for community pediatricians to always round on their patients who had been hospitalized. In January 2018, Rehm took on the role of vice chair of Outreach for the Vanderbilt Department of Pediatrics. She is currently working toward her Master of Management in Health Care at Vanderbilt University. When she’s not at work, Rehm loves to travel with her family, which has included a trip to Abu Dhabi and Dubai in the United Arab Emirates. While there, she was able to share the latest trends in U.S.-based hospital medicine with the Cleveland Clinic, Abu Dhabi. Her four sons, now 11 and 14, keep her busy with their many athletics — soccer, lacrosse, baseball, cross country and tennis. She’ll always find time for running. “I feel a million times better if I can be outside, be with friends and be on the move,” Rehm said.